Richard Collinge was a former New Zealand cricketer who played for the country in 1960's and 70's. A tall left arm medium fast bowler, Collinge is top wicket taker from a New Zealand bowler at the time of his retirement in test cricket. Collinge started his cricket career in a first class cricket match for Central District, a domestic team of New Zealand in 1963/64. His International exposure came in 1965, when he played his first Test match against Pakistan. He has a bowling figure of 5/94 in the match including 3/43 in the Pakistan's second innings. He took a total os 15 wickets in that three test match series. His best bowling performance in Test matches came against India when he had a figure of 6/63 against them. Collinge took 116 wickets in Test Cricket, simply highest by any New Zealand bowler at that time. He made in One Day Internationals (ODIs) debut in 1973, against Pakistan. His best moment in this format of game also came against Indian Team, where he had a very impressive figures of 5/23. Still his performance in ODI Cricket is not that much effective as it was in Test Cricket. Richard Collinge played for three diferent teams in New Zealand domestic cricket. First he played or Central Districts. In 1967, he moved to Wellington and played for a long period with the team. He again changed his team, now started playing for Northern Districts. His record in first class cricket is also impressive. Richard is also a handy batsman down the order in batting line-up. This evident of this is he is involved in highest partenership for the tenth wicket in history of Test cricket. 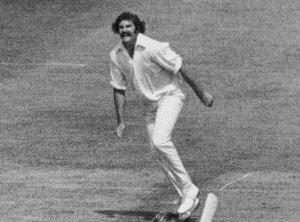 He alongwith Brian Hastings put up 151 runs for the last wicket against Pakistan at Auckland in 1972-73. In this partenership, he contributed 68 runs remaining unbeaten. This was also the highest score by any number 11 batsman in Test history till that date.